Is your company becoming more and more dependent on technology? Do you find that you’re wasting your time taking care of tech problems instead of doing your job? Or does it seem as if your tech guy is never available because he’s out sick or on vacation or helping other employees with issues? Is your tech guy so busy with support issues that he doesn’t have time to perform strategic upgrades? Does your IT guy know a lot, but not enough about the issues your company is facing or the new technologies available? These types of frustrations are the reasons that many companies choose to outsource their IT support. There are many benefits to having an outside technology company to manage and support your business technology. You can bring in a whole department to provide ongoing support through managed services at the cost of the salary of just one on-staff IT person, and you’ll have many resources available to combine their expertise to manage your systems. You won’t have to pay the hidden costs associated with having an IT person on staff, such as paid time off and health insurance. You won’t be limited in regard to what technology your company can use based on your IT person’s limited expertise, and you won’t have to pay for training your IT person in order for your company to benefit from new technologies. You won’t be left without someone to provide help with technology issues as you would if your IT person were out sick or on vacation or out for training. In addition, you won’t have to spend time to recruit and train a replacement, or possibly be stuck without IT support during the transition, as you would if your IT person were to leave the company. Your company can realize many of these benefits if you just need to supplement your IT department with resources to handle project work. If you have a small IT department that is already stretched meeting day-to-day support but your company wants, or needs, to install new hardware, configure a server or implement new applications, an outsourced IT department might be just what you need to take care of these projects. How do you choose a company to manage your company’s IT? Ask business associates who handles their IT, do your research online, and speak with representatives from your prospects. Look for a company that understands your business’s industry and IT needs, and that has demonstrated expertise through work experience and technical certifications. When you’ve narrowed your search, ask for references. Don’t overlook the personalities of the people with whom you’ll be working. 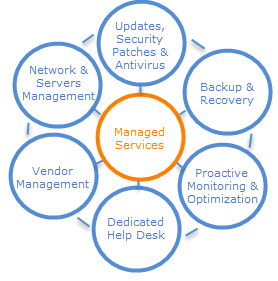 Big Idea Technology provides complete outsourced IT management services to small-to-medium sized businesses and performs project-based engagements for small enterprises. We provide the technology services you need to help your business reach its goals, allowing you to focus on running your business. When we get started with a new client, Big Idea provides a technology assessment to determine your company’s needs. We then work with you to plan a strategy to implement the desired solutions within a time frame that is reasonable for your company, on a payment plan that you can afford. Call us to discuss what we can do for you.